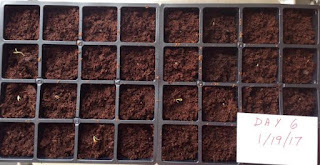 Growing Don's Garden: The Tomato Seedlings Emerge! 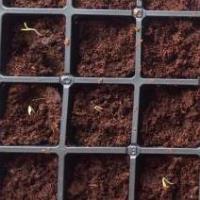 Wow, after wondering for a few days if I did everything right in starting the tomato seeds, I can see so much progress. This is day 6 and I must be doing something right. Yesterday afternoon I started to see some of the tomato seedlings pushing through the soil, but not enough where they were all the way through it. This morning, I am able to see 15 plants pushing through the soil and I suspect by the afternoon, I'll see more. I'm so happy to see the young tomato seedlings coming through. Keep checking back, because I'll keep posting photos of what is happening each day.